The Vietnam National Petroleum Group(Petrolimex) and the Vietnam Oil and Gas Group (PetroVietnam) signed a comprehensive co-operation agreement in Hanoi on September 19, 2018. Delegates attending the signing ceremony include leaders from the Party Central Economic Committee, the National Assembly Finance and Budget Commission, the Central Enterprises Bloc’s Party Committee, the Government Office, Ministry of Industry and Trade, the State Capital Management Committee at Enterprises, Ministry of Finance, and Ministry of Planning and Investment. On the Petrolimex’s side, Secretary of Petrolimex Party Committee and Chairman Pham Van Thanh; Board of Management member, Director General Pham Duc Thang; Board of Management members; Board of Directors members; and leaders of Petrolimex’s divisions/departments and its member units were present at the event. 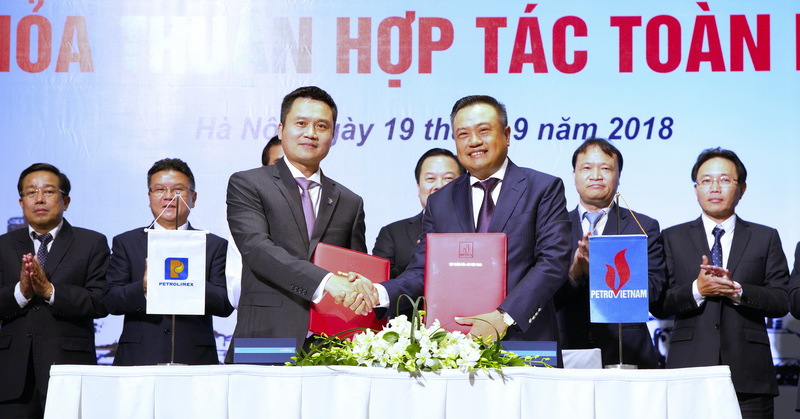 On the PetroVietnam’s side, member of the Party Central Committee and Chairman Tran Sy Thanh; Director General Nguyen Vu Truong Son; Member Council members; Board of Directors members; heads of PetroVietnam’s divisions/departments and its member units attended the signing ceremony. Under the agreement, Petrolimex and PetroVietnam will work together to promote joint investment and business activities and support each other in terms of material facilities as well as business expansion with the aim to maximise the signatories’ strengths and potentials of both domestic and foreign markets in the traditional business areas of each side and other areas of mutual interest to jointly increase value on the basis of compliance with Vietnam’s law. Both sides committed to prioritise the use of each side’s products and services; facilitate and support each other to promote production and business activities in order to maximise potentials, enhance efficiency, consolidate position and intensify competitiveness of each side based on the principle of voluntariness, equality, efficiency and benefit for both sides in line with Vietnam’s law in the course of co-operation. On the basis of the terms of this Agreement, Petrolimex and PetroVietnam will develop a plan for the implementation of specific works and action programmes to reach the objectives agreed upon by both sides. The two sides affirmed the long-term and comprehensive strategic co-operation of the two State economic groups on the basis of mutual use of quality products and services of each side, which helps promote their prestige and brand./. Contact person: Mr.Nguyen Bang – Petrolimex Public Relations Division. Address: No 1 Kham Thien St., Dong Da District, Hanoi. Contact person: Mr. Pham Xuan Son –Communication and Public Relations Division, PetroVietnam Office. Address: No 18 Lang Ha St., Ba Dinh District, Hanoi.